If you had asked me six months ago how I felt about running, I would have said very simply "I hate it." It's not something that ever felt natural or comfortable to me. In high school I was the lone person walking the mile, while the rest of my class ran it. (Though I will say I can walk a pretty mean mile in about 14 minutes.) 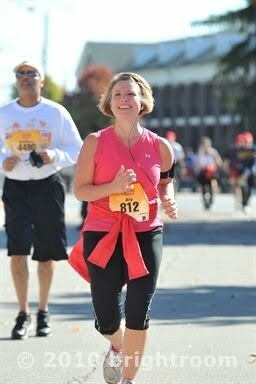 Even after power-walking a half-marathon in May of 2010, I felt no urge to push myself to the next level... dreaded running. I had my finisher's medal after all and it was the same one the runners were given. I did like the challenge of 13.1 miles, however, and over the summer I started training for another half-marathon. This time, in the heat of those summer mornings, it dawned on me that I could finish my distance in a shorter time if I picked up the pace & (ugh) ran a few miles. So I tried. After the first few days of slowly run miles, I actually started to enjoy it. I was suprised to find once you push through that first mile, your breath slows down & your body finds its pace. 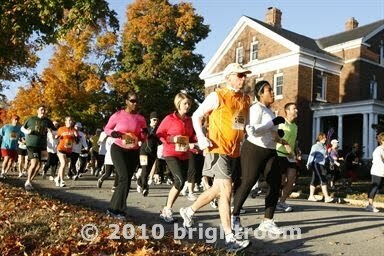 On October 16th, I took part in the Indianapolis Half Marathon at Fort Ben. My goal was to run half of the race, but once I hit the 6-mile mark I knew I could keep going. The "pack" mentality also helped. When everyone around you is running, you keep running too. And so I ran. For what felt like a small eternity. Just under three hours after I started, I crossed the finish line as a runner. And so began a love of a new sport. I now find that I'm even a little cranky if I don't find time for a weekly run. Who knew? I am now signed up for my third half-marathon, a repeat of the Geist Race Around the Reservoir that I did last May. This time I registered as a runner with an 11 minute mile. Wow!!! Good for you!!! I am always so envious of runners!!! I wish I sort of fell into a new love like that!!! This is more amazing to me than childbirth. I am so glad you've found an exercise that makes you feel great mentally and physically. And if you could just let a little of the non-hatred for running rub off on me, I'd really appreciate it!